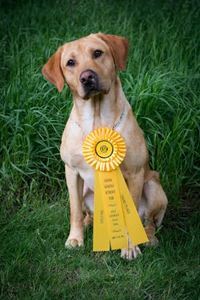 Kirby is a young talent has had success in all the games he’s played in his career and recently obtained his 2.5X Grand Master Pointing Retriever title. He is a hard worker in training and definitely shows up to compete on game day. In the pointing lab world his pedigree is second to none. Kirby has had success in AKC hunt tests, going 4 for 4 in junior and senior tests, and is currently running master tests and is 3 for 3. He also runs qualifying stakes in AKC Field Trials and has 2 3rd place finishes and a JAM. 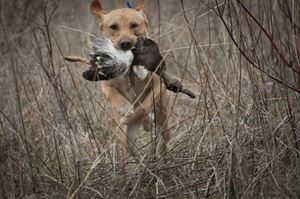 Kirby is a pin point marker and runs hard on blinds with a big water entry. In the upland he covers ground efficiently and has a very strong point and a great nose to point off the birds a good ways. Kirby has the looks, personality, train-ability, and the talent to be a top producing stud for great hunting dogs and hunt test dogs that can play in all the venues. 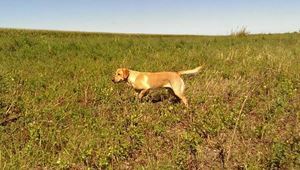 Kirby is a real team player in the field and the type of dog that can hunt ducks and geese in the morning and pheasants all afternoon, then loves to curl up at the end of the day and relax in the house.